BARDSTOWN, Ky.--(Business Wire)--The Bardstown Bourbon Company (“BBCo”), the largest new distillery in America, announced today the opening of Bottle & Bond Kitchen and Bar (“Bottle & Bond”), the first full-service Kentucky Bourbon Trail restaurant and bar in a distillery. Bottle & Bond showcases gourmet fare from Executive Chef Felix Mosso, formerly with the historic Greenbrier Resort, West Virginia, and more than 200 vintage American whiskeys curated by renowned whiskey author Fred Minnick, including some dating back to the 1800s. Located on 100 acres of active farmland inside one of the world’s most modern and technically advanced whiskey distilleries, Bottle & Bond’s scratch kitchen combines seasonal, local ingredients with regional flair. Comfort food, exceptional salads, and farm fresh meats and cheeses along with a craft cocktail program, one-of-a-kind whiskey and vintage spirits library, curated wine collection, and a selection of local draft beers, provides the perfect foundation for a memorable afternoon or evening. To bring its vision to life, the Company assembled a highly experienced food and beverage team, led by John Donnelly (“JD”), BBCo’s Executive Director of Food & Beverage. Most recently, JD was the Director of New Restaurant Openings for the Matchbox Food Group, where he was responsible for opening 15 restaurants, developing a culture of hospitality, and ensuring the highest quality experience for guests. Bottle & Bond’s Executive Chef Felix Mosso has a celebrated culinary career spanning more than three decades. Chef Mozzo is a graduate of the Culinary Institute of America and served as a Professor and Course Coordinator in its Culinary Arts and the Food & Beverage Program. BBCo recruited Dan Callaway as its Director of Beverage Operations and Bourbon Education. Dan was recently the General Manager at Decca Restaurant in Louisville, Kentucky, and is a certified Sommelier by the Court of Master Sommeliers. Bottle & Bond’s team of expert mixologists are all Certified Executive Bourbon Stewards by the Stave & Thief Society. They will not only create exceptional drinks, but they will also focus on educating the consumer about bourbon. BBCo encourages guests to enjoy an extensive range of whiskey, bourbon, and rye brands from across the globe, in addition to its own products. For the vintage whiskey library, Minnick curated extremely rare gems, including an 1890s Cedar Brook whiskey and a pair of early 1900s Overholt Rye. As part of his Fred Minnick Signature Spirits Series, in which he builds vintage spirits menus, Bottle & Bond is Minnick’s debut library. The Bottle & Bond collection tells the story of American whiskey, through each bottle, from the late 1800s and pre-prohibition through the 1950s, 60s, 70s, and 80s. In addition, Bottle & Bond showcases handmade cocktails, a wine list featuring artisanal wine makers, and craft beer on tap. 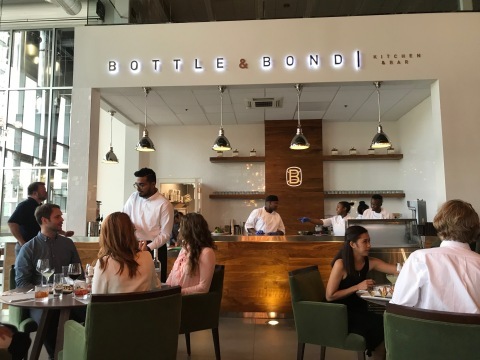 Furthering its philosophy of collaboration and education, BBCo participates in U.S. State Department’s J-1 Visitor Exchange Program and brings hospitality and culinary students from around the world to work at Bottle & Bond. As part of the program, BBCo houses the students, provides transportation, and ensures a year-long curriculum designed to teach them about local culinary arts, bourbon culture, and Kentucky. Housed within BBCo’s spacious visitors center with sprawling views of the property, the barrel warehouses, and the distillery, Bottle & Bond is open for lunch every day of the week and for dinner on Thursday, Friday, and Saturday. Hours of operation are as follows: Sunday-Wednesday (11am-5pm) and Thursday-Saturday (11am-close; last dinner seating 10pm). Reservations can be made via OpenTable or by calling Bottle & Bond at (502) 252-6331. Bottle & Bond has several unique spaces that can be reserved for private events, parties, and corporate functions, including a spacious outdoor patio with firepits and a private dining room that overlooks the main floor of the restaurant with a view into the distillery. To book a private event, please contact Garnett Black, Vice President of Hospitality, Tourism & Community Outreach at garnett@bardstownbourbon.com. An acclaimed spirits author, Fred Minnick debuts Fred Minnick Signature Spirits with Bottle & Bond. Fred Minnick Signature Spirits will be featured at restaurants and bars around the country and includes Minnick’s curated selections of rare spirits. A Wall Street Journal-bestselling author, Minnick “bourbon” headlines the annual Bourbon & Beyond Festival that in 2018 features Sting, Robert Plant, and John Mayer, among others. When he’s not hanging with rockers, he’s a student of bourbon and brings the same intensity to his Signature series that he has to his popular books Whiskey Women, Bourbon Curious, Bourbon, Rum Curious, and Mead.